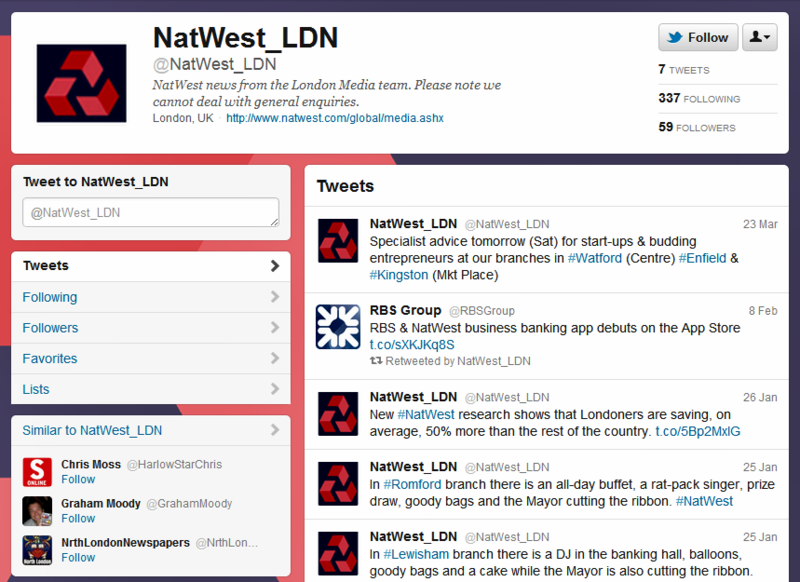 Natwest Bank in the UK celebrated the first anniversary of its twitter presence for its 7 regional accounts. But none of those accounts are active, tweeting just a couple of times a week on average. Let me clarify one thing first. The title should read ‘…but Show a Very Low Level of Activity’. I like this case study as it reflects well one of the most common questions our clients and other event participants ask us: we would like to leverage twitter, so should we launch one main corporate account to do everything? Or should we launch several twitter accounts to cover specific geographical areas and regions, market segments, or applications like media relations or customer care? In this particular case, someone at Natwest, quite possible advised by another digital agency with too much influence on their financial services clients, made the decision to launch not one main account, but 7 regional ones. This is consistent with the stats we shared with our readers six months ago: 90% of the twitter accounts in financial services are inactive. That statistic was extracted from our popular Visible Banking Twitter Watch series (we benchmark over 1,700 accounts in 78 countries). If there is not one true answer to the question I mentioned at the beginning of this post, one of the things to consider is the countries where you operate and their twitter penetration which will impact the volumes of conversations, I would always recommend to start small, with one official account, get to understand the medium, and then start building a mini ‘twitter empire’ a la Dell with several accounts if it makes sense. If you are interested in the topic of social customer care, and in particular customer care via twitter, I invite you to read my recent post ‘Social Customer Care: Now Way Back. Pandora’s Box is Open.‘. I have always been a big supporter of bridging the gap between social media and the real world, and tapping social media to translate to the digital world your knowledge, your understanding, your support of your local communities and local businesses. So the idea of one account per region, large city or branch appeals to me tremendously. But I have some good news: it wouldn’t take much to turn Natwest’s situation around and take the bank’s presence to the next level, at the regional level, with the right content strategy (type of content, existing content, syntax and frequency of the tweets) and a Know Your Followers (KYF) strategy. And we all know that social media is not all about size (do we know that? ), but FYI to make the Top 10 most followed financial institutions on twitter in the UK (we are currently tracking over 120 accounts), a financial institutions would need over 4,500 followers.